I saw the Daredevil movie and I enjoyed it. I'll leave the reviews for others and concentrate on my usual broken record: the comic book source material. 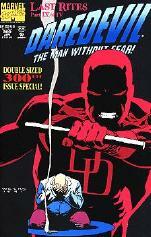 It's impossible to mention Daredevil without mentioning Frank Miller. 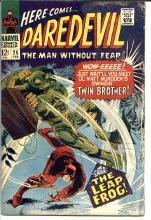 Some people think Miller "made" Daredevil, however, most readers don't realize that Frank started as a penciller working with a writer and he eventually took over both jobs. Yes, he created Elektra. And while he did not create Bullseye, he certainly defined him. Under Miller, DD became the (now often-overused) grim and gritty hero of Hell's Kitchen. I truly enjoyed those issues as well as Frank's return to the character in the "Born Again" story arc and the "Man Without Fear" mini-series. 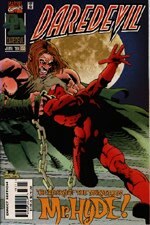 A few years ago, moviemaker and comics fan, Kevin Smith, gave readers his take on old Hornhead with a story arc called "Guardian Devil." I like this story as well and recommend it highly. 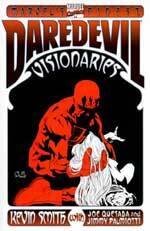 But Daredevil is much more than just the work of these two high-profile creators. 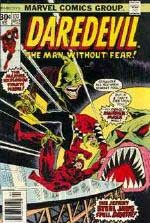 Daredevil has been published since 1964 and many talented creators get ignored or over-shadowed when the more than 400 issues get summed up solely with the work of Miller and Smith. Here's a list of some DD stories that may not get as much press, but still deserve a look. These are all from Daredevil Volume One. 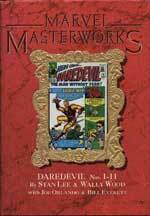 Beginning at the beginning always makes sense, Essential Daredevil Vol. 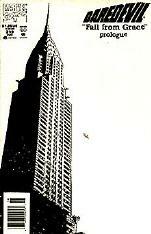 1 contains reprints of issues 1 to 25 in affordable black and white. 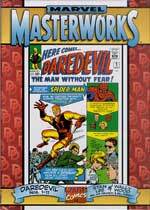 There have also been two Daredevil Marvel Masterworks hardcovers which reprint issues 1 to 20 in color, but are much more expensive. Early in his crime-fighting career (#25), DD's secret identity had been revealed to his friends. Thinking quickly, Matt Murdock immediately creates another identity for himself; that of his TWIN brother, Mike Murdock, who wears loud Hawaiian shirts and has messed-up hair. Even though Matt and Mike can't be seen together, it fools his friends. Then, Matt has to fake his "twin's" death. And you thought soap operas did this stuff better! 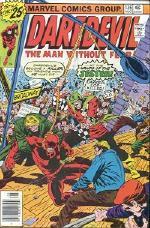 On a personal note, some of my earliest DD comics were #135 to 137 featuring the Jester (think DC's Joker) who convinces New York City that Daredevil has gone bad and the world is going insane. I bought this when I was eight years old, which is probably why it still seems so cool today. Leaping over the aforementioned Miller eras, we come to issues 297 to 300 which have been collected as the "Fall of the Kingpin." 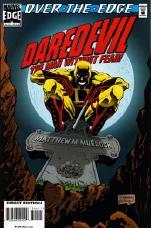 Kingpin returns (naturally) and Murdock is forced to "die" in the "Fall From Grace" (#319 to 325) arc that gives DD a new costume and a new secret identity. I wasn't fond of either, but that story is resolved in issues 340 to 350 titled "Inferno" which redefines him (again) and returns his costume and Murdock identity. 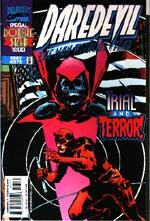 Also worth mentioning is a run by writer Karl Kesel, who came on issue 353 and added humor back into the title. DD was a bit more of a wisecracking swashbuckler and I loved it. Towards the end of Volume One (#365), writer Joe Kelly produced the "Trial of Mister Fear" and really fleshed out Matt's supporting cast. This entire trip down Back Issue Memory Lane means nothing unless you seek out some comics. At the very least, visit manwithoutfear.com which was the website I used to nail those issue numbers. 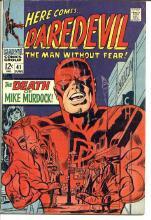 That site concentrates on the Daredevil comic and its storied history. It has cover images and summaries and an impressive list of DD creators. To summarize, I liked the movie. I like the comics better. 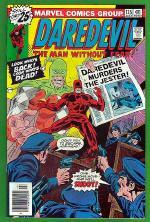 I like and respect guys like Frank Miller and Kevin Smith, but also wish more attention would be given to the other hundreds of great Daredevil stories out there. Look for 'em. All comments (c)2003 John Steib and may not be reproduced in whole or in part, without written permission of the author.